They provide needed waste to fertilize your vegetables in your aquaponic system. They eat waste from your Koi and pond plants in your pond. And they are a great source of food you can grow yourself. 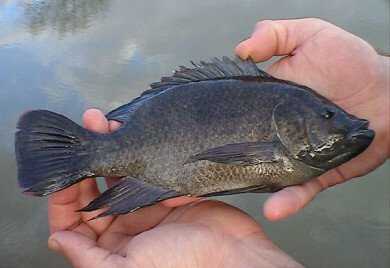 The Mozambique variety of Talapia are native to South Africa. This species has become very important to agriculture in tropical and subtropical areas around the Globe. They are gray to olive above; dull yellow to gray-green on side; yellow below. Young have 6-8 black bars on side. Breeding males are mostly black, often with mottling or an iridescent blue tinge; throat and cheeks conspicuously white; dorsal fin black with red border; caudal fin with red distal border; pectoral fins red; with blue upper lip. 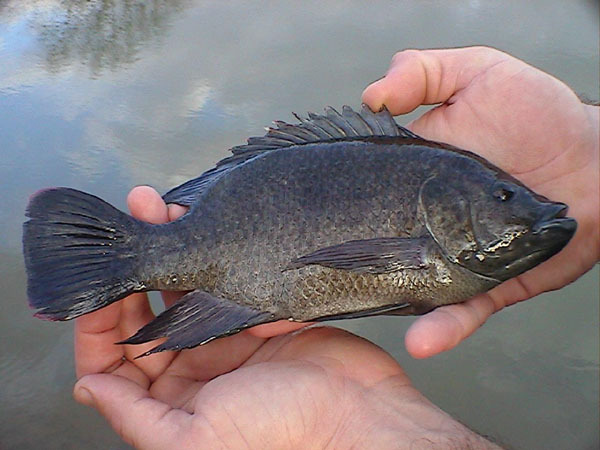 Tilapia are omnivorous and feed mostly on planktonic algae and other aquatic plants. They also will consume aquatic insects and isopods. They will also thrive on 32 percent protein or better fish food. This species can withstand water temperatures up to 105 degrees. But will often die off in water below 53 degrees. One of the most adaptable fish species among all fish. They are very tolerant of very low dissolved oxygen levels. This species can live in salt, brackish or fresh water and are now found across the globe in subtropical climates. They usually obtain weights of 2 ½ pounds in the first year of growth. In lakes where water remains warm 5 pound fish are common. The average life span is 11 years but they are of an eatable size in as little as 6 months. This species will reproduce continually in water with temperatures above 68 degrees. They are maternal mouth-brooders, carrying fertilized eggs in the mouth. Which means that the female will hold the eggs in her mouth until they hatch. A male will establish a territory which if a willing female approaches he will circle. The female releases numerous eggs, then turns and collects them in her mouth, as well as the milt deposited by the male; thus fertilizing the eggs. This act is repeated until 100-400 eggs are laid, the number depending on size of the female. Once spawning is complete the female is chased out of the territory by the male, who proceeds to court other females. For the next 11-12 days, the female will incubate the eggs while remaining hidden. At the end of the incubation period, the female releases the swimming larvae from her mouth. For 4-8 days, the young remain near the female in a school, and will return to her mouth or cluster around her head when threatened. Commercially grown tilapia are almost exclusively male. Because of their large size, rapid growth, and palatability, tilapiine cichlids are the focus of major farming efforts. China is the largest tilapia producer in the world. Tilapia rarely compete with other “pond” fish for food. Instead, because they consume plants and nutrients unused by other fish species and substantially reduce oxygen-depleting detritus; adding tilapia often increases the population, size and health of other fish.